I love this picture. This is my sister and I. It is a coming together of two individual pictures to create one very cool picture. My sister is the one with the lighter color hair and she is smiling. I am the one with the hoop earring, not smiling. 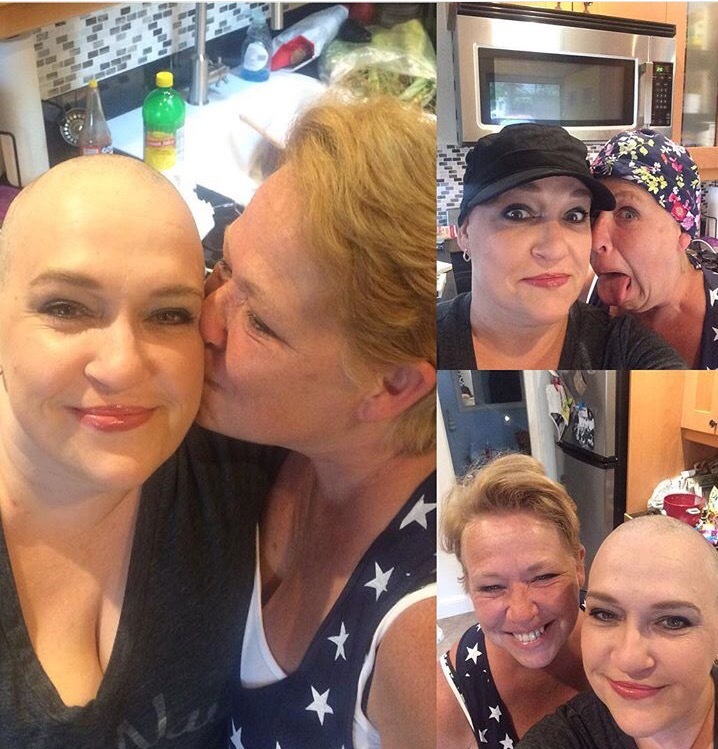 She texted me this picture right after my second round of chemo. She had taken the pictures that day in the Dana Farber atrium. We had stopped in for a few minutes before my infusion. It was a warm, quiet place with an incredible view of Boston. I would never have made it through this past year without her. She was with me the day I found out I had cancer. She drove me to every infusion through Boston city traffic, even though she has a fear of highway driving. She was there for every surgery and doctor appointment. She listened and asked questions when I was too afraid or overwhelmed to get the words out of my mouth. A hairdresser by trade, she was the one I called to shave my head the day it kept falling out in big pieces. There I was sitting on a kitchen chair while she carefully shaved every strand. Tears rolling down my face. After it was done she took me to the bathroom mirror. I was frozen. Staring in the mirror at someone I did not recognize. She leaned in close and whispered, “You’re beautiful.” I turned around only to see her making faces at me wearing the hats and scarves I had brought with me. Days later I went back to her house and we sat and watched YouTube video tutorials on how to tie a head scarf. I am happy to report that I am now a pro. I am even happier to report that my hair is growing back in now and I no longer wear them. She was my rock. Our drives to Boston became therapy sessions for us both. I would talk about everything but cancer and she would talk about how I was avoiding my illness and pretending that I was not sick. We sat together for over six hours on infusion day. Talking, laughing, reading inappropriate jokes and I am sure, annoying everyone else getting chemo. We cried together the day we saw a husband hold up his wife in the waiting room chair. She was not going to make it another week but there he sat with her frail body in his arms. It was too much for us both. She called or texted me every morning and every night. She urged me to rest on days when she knew my two hour commute was going to be too much. She was my Dr. Google when I would get results in my patient portal before the doctor had called with the results. 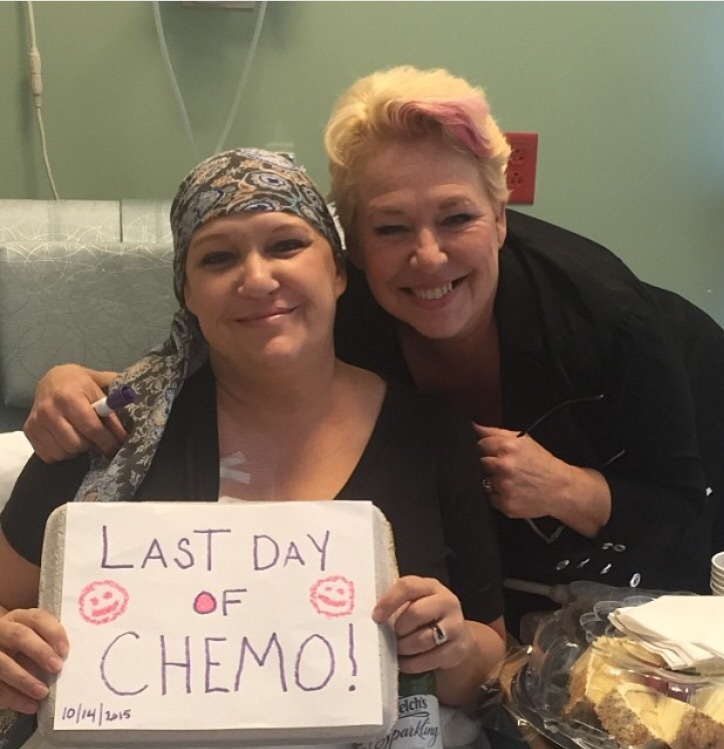 She celebrated with me when we finished round six and finished chemo all together.